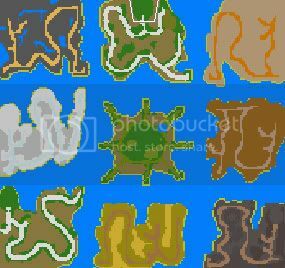 Guyz... one suggestion to all map makers out there. So I'd rather play a normal map at a good framerate than bust my eyes staring at the fragmentation I'm getting on these overcharged maps. lol... you know what you can do with it right? no I don't but I guess you do?? For crying out loud okrane..
One thing should never be forgotten - if not for the devotion of map makers, we would still be playing around on Peninsula and such. These people that make heroes thrive don't ask anything in return except for some appreciation. well said Strider, a complete miss to show such an unthankful attitude Okrane, most people love maps with a bit more than barren desert, and it works very well on my crappy computer aswell. What a mess and confusion. There's a reason it's called a submission thread you know. Edited by insatiable at 19:16, 31 Oct 2008.
time travel - off topic! Edited by plasia at 05:28, 23 Nov 2008. This is a map I created for my friends and I to play in hotseat against the AI. We have always played heroes like this, since HOMM3 with Realm of Chaos Allied. One thing that has always been in a short supply for HOMMV is allied maps. Initially I got around this by editing the map Former Friends to make it 2v2, however there are 3 of us and although we've had lots of fun with my hack it just wasn't the same. Initially I wanted to remake Realm of Chaos for HOMMV but I decided to postpone that project until I was more experienced (this is my first map). Instead I based it loosely off the Former Friends map that I am familiar with and expanded the concept for 4v4. - Central underground has a guarded relic artifact to make it more worthwhile going down there. This map is 4v4 currently but it could easily be a FFA or indeed any team variant, just open it up in the editor and select whatever team settings you want. - Realm of Plasia has got to be the stupidest name for a map ever, if anyone comes up with something better I'd like to know! Any tips, suggestions or gameplay issues you may have would be really great. A more suitable forum would be here. A few comments: Visually appealing map though a bit simple, I suppose by week 2 you clear all mines and head for middle, maybe week 3 if unlucky with neutrals or with a slow faction. Looks like a map where fast factions like dungeon or necro have a clear advantage and get utopia first but it depends on how your friends play I think that not all the pathways leading to utopia are even, some have more tiles to travel to get there. That said I did not notice if their portal is closer to town so it may be intentional. I think it would be better to give some bulk on certain areas, would give a fresh look and make it more real. Maybe add something around the starting towns or place them in a plateau but that's just personal preference. Edited by plasia at 14:56, 12 Nov 2008. I didn't post in maphaven because the table of contents said I should post in the "H5 Map Index" thread... which hasn't been posted in for more than a year. Also since I just registered I can't create a new topic. When I made the map I wasn't that concerned about how long paths were and such. This was definitely a mistake, I can probably do an ugly hack of a fix by making the spurs shorter/longer in the center.